Here in Ontario, particularly around the Great Lakes, we are blessed with plenty of clean, fresh water. With an abundance of this life-sustaining liquid, it’s so easy to take it for granted. All the more reason to protect it. If properly managed, we can sustain this most important resource for generations to come. One of the key factors in maintaining our water supply is fully understanding where it comes from and how it gets to our faucet. In Northumberland County we are fortunate to have plenty of natural areas, including the all-important Oak Ridges Moraine, which runs east-west through the middle of a good portion of the county. What makes the ORM so vital, in terms of source water, is the fact that most of the watercourses in the county originate here. These watercourses service our larger communities, not to mention flora and fauna, before emptying into either Lake Ontario or Rice Lake. The Oak Ridges Moraine stretches a long way west of Northumberland as well, right across to Caledon, north of Brampton, in fact. It is a great benefit to all the communities in between. While the ORM is a significant conservation and protection effort, thanks to the hard work and dedication of many organizations and individuals, it is not enough to protect against threats, such as development, deforestation and mining, in the rest of the region. But there is another, larger protection area, which may help. Wrapping around the Golden Horseshoe, the Greenbelt actually incorporates much of the Oak Ridges Moraine, and will be a major player in the natural future of the Greater Toronto Area. But currently, the Greenbelt ends at the Northumberland County border. Led by David Crombie, The Provincial Land Use Advisory Panel has released a report that reviews Ontario’s four land use plans. In the report, there are 87 recommendations. One of these is to grow the Greenbelt. One of the key areas for expansion is Northumberland County. Sustainable Cobourg supports this initiative and wants to inform the Provincial Government of the benefits of growing the Greenbelt in our region, but they need your help. If you are concerned, or even interested, in the future of your water, and in fact Northumberland County as a whole, we invite you to attend an information session hosted by Sustainable Cobourg on Wednesday, February 24, 2016, at 7:30 p.m. Click here for more information. Similar to turning off the water while you brush your teeth (which should be a no-brainer by now), try a navy shower. I’ve been doing this for as long as I can remember and it’s just second nature. After the initial rinse and shampoo, I turn off the water while I soap up, then turn it back on to do the final rinse. Trust me, you’ll get used to it. Don’t use your showerhead at full pressure. I already have a low-flow showerhead but over the years I have found the ‘sweet spot’ between too high and too low. This will vary with each showerhead so do some experimenting to see what is comfortable for you. Remember, every little bit helps. Okay, some of you may not agree with this one but, do you really need to shower every day? Some of you are saying, “um, YES!”, and I totally respect that, but for many of us, every other day should be sufficient. Obviously, there will be exceptions to the rule here (people who sweat a lot, hot summer days, etc. ), but if you can swing it, try it. Even 5 days a week is an improvement. It takes a lot less water to dunk your head under the faucet to quickly fix your hair than a full length shower. Yellow, let it mellow. Brown, flush it down. Need I say more? Admittedly, not for everyone. Rather than filling your sink to do dishes, start with a medium-to-large pot or bowl. Chances are you have a dirty one somewhere anyway so put your soapy water in it then start by washing the smaller items. When you have enough water, dump the bowl or pot into the sink to wash the bigger items. If you have a second sink, take advantage of it by using it to rinse your dishes. Put the drain stopper in and rinse your dishes over the sink as you normally would. Once the water fills up enough you can just dunk your dishes in the accumulated water without having to turn on the faucet. I like to keep a water jug near the kitchen sink to collect water in, such as that glass of water I left in the living room overnight. Rather than pouring relatively clean water down the drain, simply pour it into your jug, then use it to water plants or rinse your recyclables. I have a jug with a long narrow spout – perfect for getting water into those empty milk bags. Get a rain barrel. This is another one that should be commonplace and it’s easier than ever to get one. They range in size, colour and price and are relatively easy to install. Unless you have acres of land that need regular watering, a few rain barrels in key locations should meet all your garden-watering needs. Don’t waste your drinking water on your plants. They prefer that warmer, untreated rain barrel water anyway. Get on the waiting list for your rain barrel now at rainbarrel.ca/habitatforhumanity. Even if you cannot handle all of these, do what you can. The important thing is that you take them on slowly so that you don’t get discouraged and give up easily. Pick one or two that you think will be the easiest, then once you have them mastered, slowly take on the next one, and the next one. You’ll help to save our precious water, and your money too! 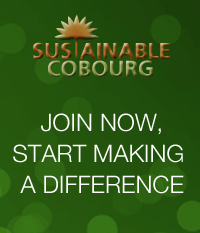 Drew Johnson has been a Sustainable Cobourg Board member since 2013. He currently manages SC’s website and social media pages as well as its membership. Drew has always been passionate about finding ways to lower his ecological footprint and believes in teaching by example. This entry was posted in Blog, Climate Change, Eco Action, Environment, Food & Organics, Health, Political, Sustainable Planning, Waste and tagged climate, climate change, Cobourg, development, documentary, emissions, environment, event, farm, farmers, farmland, film, food, gas, green, greenhouse, local, master plan, Northumberland, Ontario, planning, provincial, sustainability, sustainable, Transportation, Waste. Bookmark the permalink. Great article. You should get it published in Northumberland News!